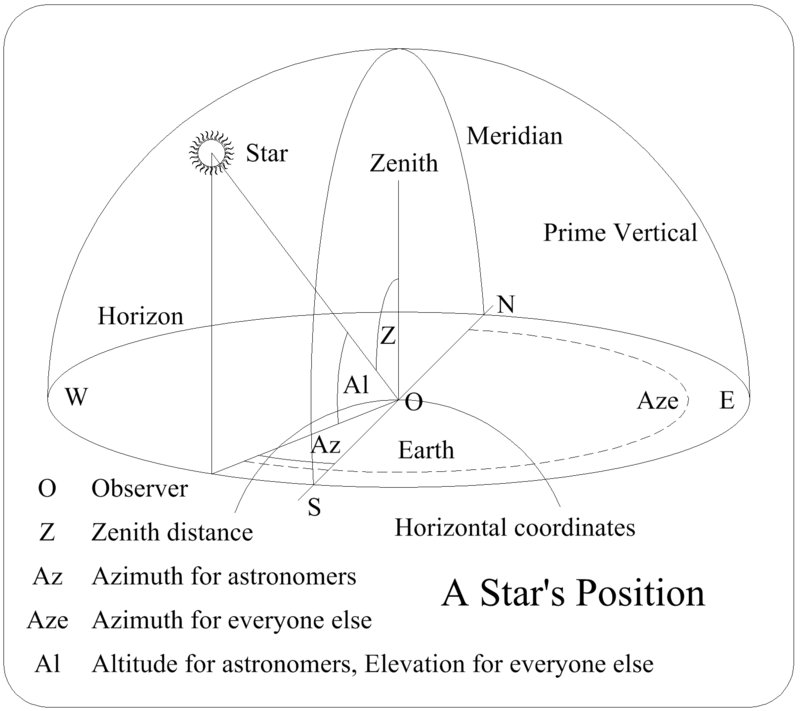 It is necessary to know the position of a star. 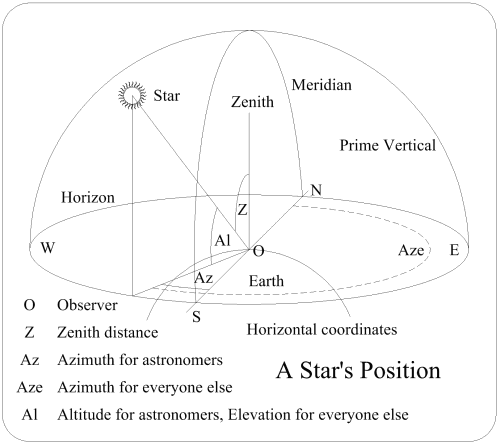 For any observer a star's position can be specified as shown in the drawing. But this position is relative to the observer's place on the Earth's surface, & only valid at a particular time. Something better is needed; Something to let everyone, at any time, know how to find that star. Before moving on, notice how the stars apparently move; knowing what to expect helps one to understand. 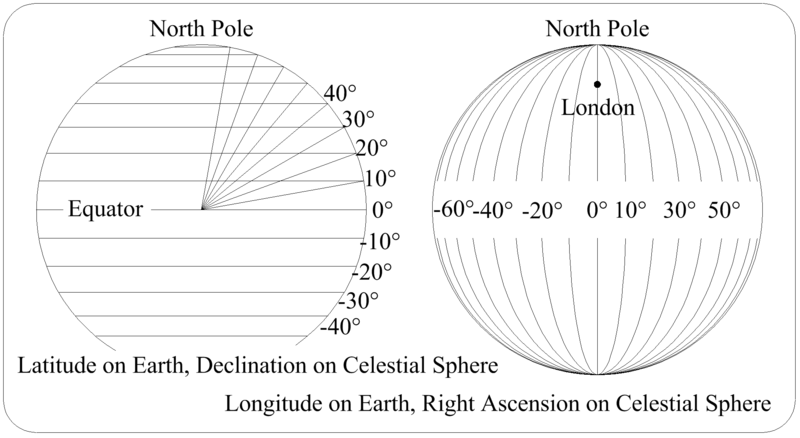 The Earth rotates around an axis defined by the North & South Poles. An observer at a pole will see the stars apparently rotating around the pole. As the obsever travels toward the equator the stars' apparent movement will change: the drawing shows how. Imagine a perfect sphere centred on the Earth & expanded out to infinity. This sphere is called the Celestial Sphere. The stars are so far away that they appear as little lights on this huge surface. Just for interest, the Ptolemaic view is shown; it assumes that the Earth is at the centre of the universe, & that everything revolved around it in circles. The correct view is the Keplerian. Note that the Ecliptic is defined incorrectly in the Ptolemaic view. To ensure no confusion, the Ecliptic is the plane of the Earth's orbit. 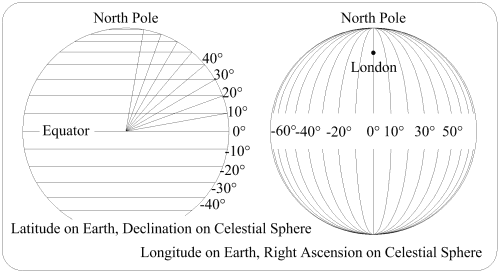 The poles, on the sphere, are called the North & South Celestial Poles (NCP & SCP). The equator is called the Celestial Equator. The equinoxes & solstices now have precise locations: the eqinoxes occur when the Earth crosses the intersections of the ecliptic & the celestial equator, & the solstices are 90° around the ecliptic.